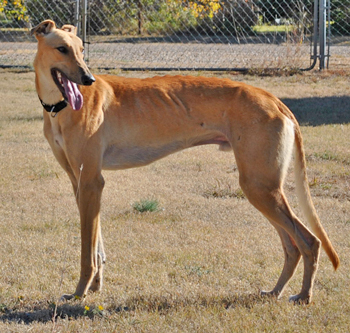 Flyer is a 2½-year-old fawn male born November 2008 as the "E" pup. His registration number is still being researched at this time. Flyer was picked up on Friday, October 22, from the Amarillo Humane Society. He was found as a stray by the Potter County Sheriff's Department. Flyer was the name on the plastic collar that he had on, so the name stuck and he answers to it. 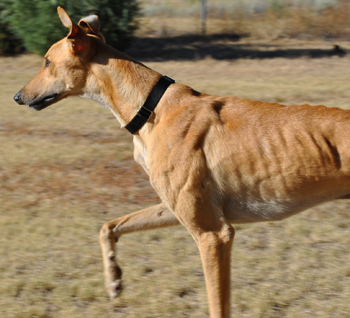 He originally tested positive to Ehrlichia and Babesia. Treatment for these tick borne diseases is now complete and successful, and Flyer is ready to soar into a forever home! Flyer is not cat tolerant and has not been tested with small animals at this time. 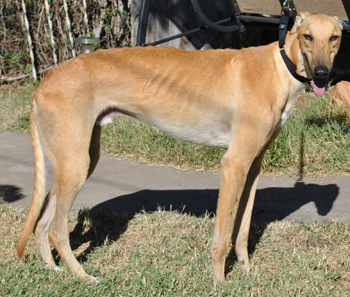 Flyer is such a sweet, loving and easy going boy. He has perfect house manners, doesn't counter surf and has never had an accident in the house. He crates well when we are gone and sleeps through the night on his bed in our bedroom. When he sleeps he always has a big grin. He loves to go for walks and does well on a leash. Flyer does fine with other dogs. If you are looking to add a new member to your family don't let your chance "fly" by. Check out Flyer, you will be glad you did.